When I first imagined making this scrumptious cake, I thought it should be round. 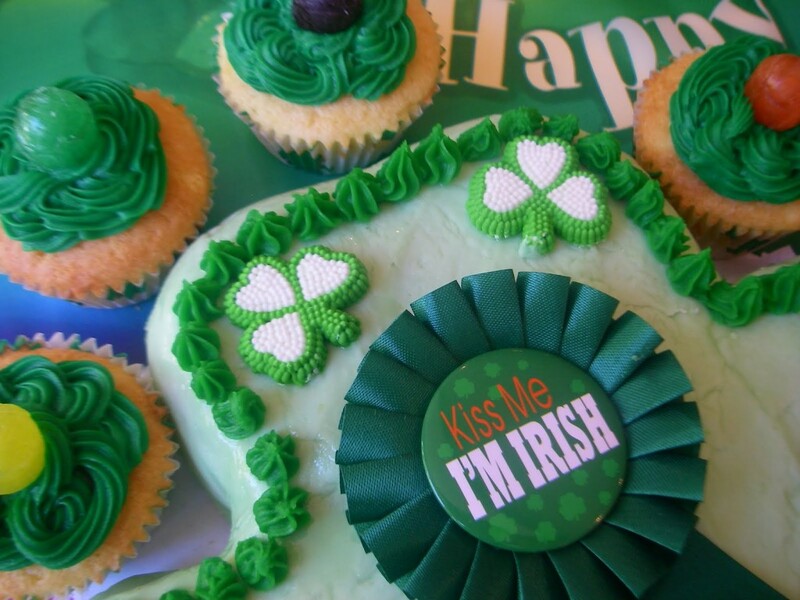 But then I thought, “Naaah, decorated cupcakes are more fun.” I also bought a clover leaf cake pan and delved right into the festive spirit of St. Patrick’s Day. My version of this springtime cake contains no butter – the “cream” in the frosting comes from fresh avocado with an added tangy surprise. The result is a rich and delicious Irish Whiskey Cake. You and your guests can reach for that second or third piece guilt free – enjoy! 1. Preheat oven to 325F˚. Grease and flour either a 9-inch round cake pan or a clover leaf cake pan; set aside. If making cupcakes, line the muffin pans with baking cups and set aside. 3. In either a stand mixer fitted with a bowl or a conventional mixing bowl (using a hand mixer), beat together the sugar, oil, eggs, whiskey, vanilla and lemon zest until smooth. 4. On low speed, stir in the dry ingredients and mix until batter is smooth, about 2 to 3 minutes. 5. Pour the batter into desired cake pan or into the muffin cups. 6. Place cake pan on a rack positioned in center of oven and bake 30 to 35 minutes or until knife inserted in center comes out clean. 7. Alternatively, place muffin pans on top and bottom oven racks and bake 20 to 25 minutes or until knife inserted in center of one cupcake comes out clean. 8. Transfer cake pan or muffin pans to counter and set aside to cool. 9. When cake is completely cooled, unmold it and transfer to a serving platter; set aside. 1. In a 1-quart mixing bowl, whisk together the mashed avocado (with all lumps broken down) and 5½ cups of the powdered sugar. 2. Mix in the lemon juice and whisk until smooth. If frosting appears to thin, add a little more sugar and whisk until consistency is smooth and creamy but firm enough to hold its shape on top of cake or cupcakes. 3. With a spatula or flat, round-tipped knife, frost the cake or cupcakes. 4. Using the tube fitted with a tip, make decorations over frosting. The cake or cupcakes can be served the same day or made a day ahead, covered in a foil tent and refrigerated. To foil tent a cake, place 6 to 8 toothpicks halfway into cake and spaced out throughout cake surface. Create a tent with aluminum foil sheets that are large enough to cover cake and secure around platter edges. *Note – A 10 or 11-inch square cake pan can be used as well.